The Lockheed P2V Neptune can trace its maritime patrol ancestry back to the Lockheed-Vega Hudson. The Hudson, a twin engined, twin tailed low wing aircraft, was a bomber version of the Model 14 Super Electra airliner. 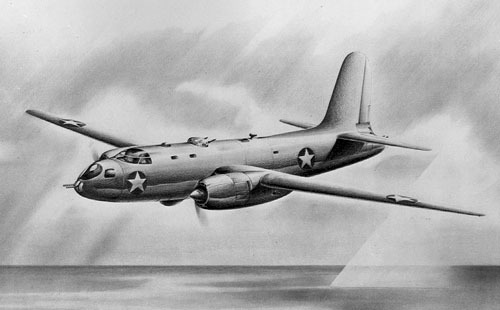 The Hudson was Lockheeds answer to a British Purchasing Commission search for a general reconnaissance aircraft. Design work began in 1938 and the resulting Model B14L lead to the delivery of more than 2941 Hudsons to the UK and to the USAAF. Lockheed-Vegas follow up to the Model 14 was the Model 18 Lodestar. The British, well satisfied with the Hudson, were interested in a 1939 Lockheed-Vega proposal to produce a military version of the Lodestar. After further discussion, the RAF ordered 300 examples of a more advanced development of the Model 18, and christened it Ventura I. 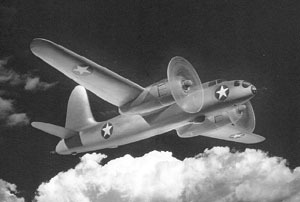 As was the case with the Hudson, the USAAF also took delivery of 200 Venturas, designated as the B-34-VE in US service. 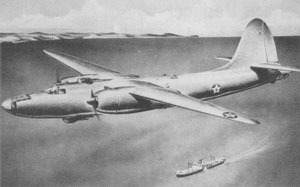 When Navy patrol squadrons assumed full responsibility for antisubmarine warfare, the USAAF discontinued procurement of the B-34 so that Lockheed-Vega could concentrate on producing a specially configured maritime patrol version for the Navy. The PV-1 was optimized for its primary mission with an increased fuel capacity, modified defensive armament, the installation of an ASD-1 search radar in the nose and could carry eight 5-inch HVAR rockets mounted on the wings. 1600 PV-1s were delivered to the USN with many aircraft diverted to the RAF, RAAF, RCAF, RNZAF, SAAF, and the F�r�a A�rea Brasileira. When the production of the Ventura was transferred from the USAAF, the Navy and Lockheed-Vega began discussing a major redesign of the aircraft to further tailor it for the maritime patrol role. The Vega Model 15 had an increased wing span, which allowed an increase in fuel capacity and an increased bomb load. With an estimated increase in range and improved field performance, the Navy ordered 500 aircraft designated PV-2 Harpoon. Delivery of the Harpoons began in March 1944. Delivery of the last PV-2D Harpoon occurred in September 1945 bringing production of the Ventura and Harpoon to an end. After the war, the Navy transferred Harpoons to France, Italy, Japan, the Netherlands, Peru and Portugal. Even before the United States entry into World War Two, it had become apparent that the US Navy would need a land-based patrol bomber with greater range and armament, higher level and climbing speeds and slower approach and landing speeds than the Hudson and Ventura. What the Navy needed was an aircraft designed specifically for the primary mission of day and night ASW and anti shipping operations. Although no official requirement was issued, preliminary work on V-135 was begun in September 1941 by chief engineer John B. Wassall and his Vega team. The initial concept called for an aircraft with a gross weight of 25,000 to 35,000 lb., power operated turrets, tricycle landing gear and the ability to carry two torpedoes, bombs and depth charges internally. The favored powerplants were a pair of eighteen cylinder Wright R-3550s producing 2000 hp. Mac V. F. Short, at the time, Vice President Engineering of the Vega Airplane Company authorized the first internal work order for design studies of a new aircraft on December 6, 1941. Progress on the new patrol plane was slow as the Navy needed proven aircraft during the critical months following the Japanese attack on Pearl Harbor. Eventually, by early 1943 the Navy switched its procurement attention from acquiring immediately available aircraft, to supporting the development of newer and more capable types. The Navy issued a letter of intent on February 19, 1943, to the Vega Airplane Corporation for two XP2V-1 prototypes based on the V-146 design study. The V-146 was itself a development of the V-135 with a revised tail, a lowered wing and a relocated dorsal turret. Contact NOa(s)-375 was awarded on April 4, 1944 for the construction of the two prototypes, and ten days later, Contact NOa(s)-3297 for fifteen production P2V-1s. During this time, the PV-2 Harpoon still had a higher priority than the XP2V-1 in both engineering staff and floor space allocation. It was not until the summer of 1944 that project engineer R. A. Baily was able to get the project into high gear. The main development objective of the V-146 was to maximize target detection and increase offensive power against those targets. Through the use of new designs and improved production techniques, Lockheed was able to meet the designs need for long range, short takeoff and easy maintenance. This design philosophy would a provide easier production and decrease the manufacturing cost of each individual aircraft. One design feature was the major portion of the fuselage contour was curved in only one direction which permitted the use of uniformed metal skins. Expensive forming was eliminated by producing the center wing and mid fuselage sections, including the bomb bay door area, as a continuous cross section. This allowed multiple use of numerous parts and assemblies. The wing and fuselage intersection was unfilleted, the wing box running continuously through the fuselage. This also allowed the entire bomb bay load to be directly distributed throughout the wings. The Neptune was also designed to be manufactured into easily accessible sub assemblies, keeping mating and final assembly time to a minimum. With all of these considerations, the Neptune became much more serviceable. A complete engine change could be accomplished in 30 minutes, a propeller in 22 minutes and an outer wing panel in 79 minutes. The attention to production and tooling details ensured that Lockheed would set economic standards that would set a precedent in the aerospace industry. In the spring of 1945, thirteen months after the initial contract was awarded, the Neptune was ready to fly.